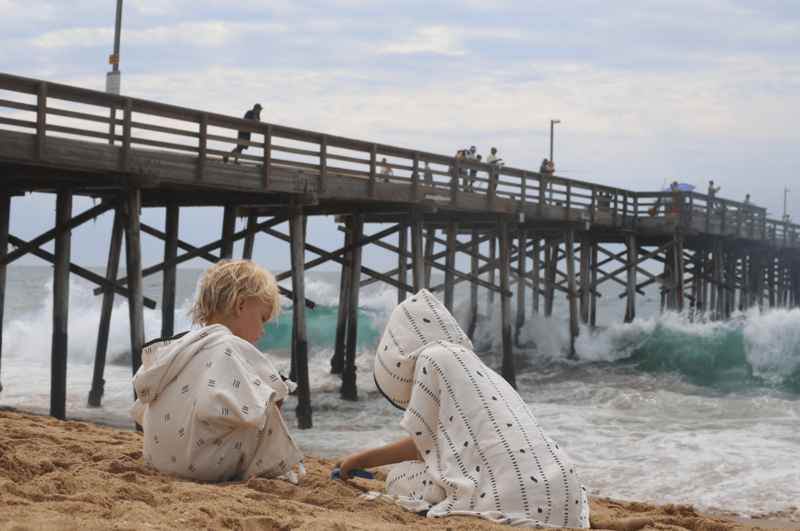 Snapped a few pics of my boys in their Kindhood towel ponchos while we were beaching it this weekend in California and had to share. My friend Carly started this company and I am thrilled to team up on a really great giveaway on Instagram, too! (@smallfryblog) You guys are gonna flip over these, read up below! I made the switch to towel ponchos earlier this Summer (SO much easier than schlepping/dragging everyone’s towels) but there are only a few designs anywhere and they’re not that great. Then came KINDHOOD! I currently have these hanging in the bathroom as they have also replaced my boys’ bath towels! Kindhood is terry lined and made with bamboo cotton which is THE softest material you can find. So silky and buttery and cool to the touch. These fabrics have a 97% UV ray filter so once they’ve had enough sun, but maybe not enough play, the fun doesn’t have to stop! It’s also moisture-wicking and the bamboo is antibacterial, too! I have been loving these for bath time, and don’t have to worry to much if I forget to bring them in from the car after the pool. See all their darling prints here, they also have infant towels! Anyway, I hope you all love them like I do and grab some for your water babies for bath time or get a headstart on Fall break vacation plans! Head to Instagram to win one for you and a buddy! !